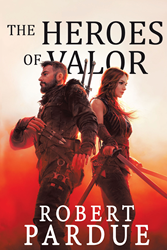 Recent release “The Heroes of Valor” from Page Publishing author Robert Pardue is a magnificent journey of unlikely heroes uniting to thwart a rising peril threatening to ravage nations and lives. Robert Pardue, a serviceman in the US Army for six years with positions in Aviation, Civil Affairs, and Airborne units; and a graduate with a BA in human sciences from Texas Tech University with minors in sociology, English, and theatrical design, has completed his new book “The Heroes of Valor”: a well-written opus about a group of otherworldly beings banding together to save their dying world from an ancient evil seeking to destroy and dominate. Published by New York City-based Page Publishing, Robert Pardue’s edgy book is an engaging addition to the fantasy-genre paperbacks of modern times. This fictional read takes the readers on a breathtaking adventure to exploring the true meaning of chivalry and accepting the past to defeat the gloomy future. Readers who wish to experience this canon-worthy work can purchase “The Heroes of Valor” at bookstores everywhere, or online at the Apple iTunes store, Amazon, Google Play, or Barnes and Noble.